Over the weekend I was paying particular attention to the in-running odds being offered on various games and was once again felt that punters overestimated the probability of the favourite ultimately winning, especially when it was trailing. I've investigated this issue before, in a slightly tangential manner, in this blog where I concluded that the starting prices of teams became virtually irrelevant to a proper assessment of their victory chances largely after half-time and almost entirely after three-quarter time. The 71% underneath the coefficients for this so-called QT Model denotes that the fitted model correctly predicts the winning team in 71% of cases if we use 50% as the cutoff for converting the fitted probability it gives for the favourite's winning into a binary prediction of the outcome. 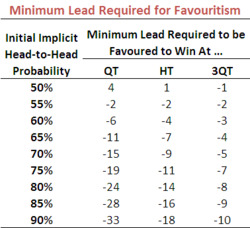 If you run your eye across the first three columns you'll see that, numerically, the coefficient multiplying the favourite's initial probability declines as the quarters proceed, hinting at the diminishing importance of this variable in predicting the ultimate game victor as asserted earlier. To more formally measure the diminshment of the importance of the favourite's pre-game probability I employed the R hier.part package to estimate the individual contribution of the two regressors - the favourite's pre-game price and its lead at the quarter break - to the explanation of the model outcome, in this case the winning of the game. 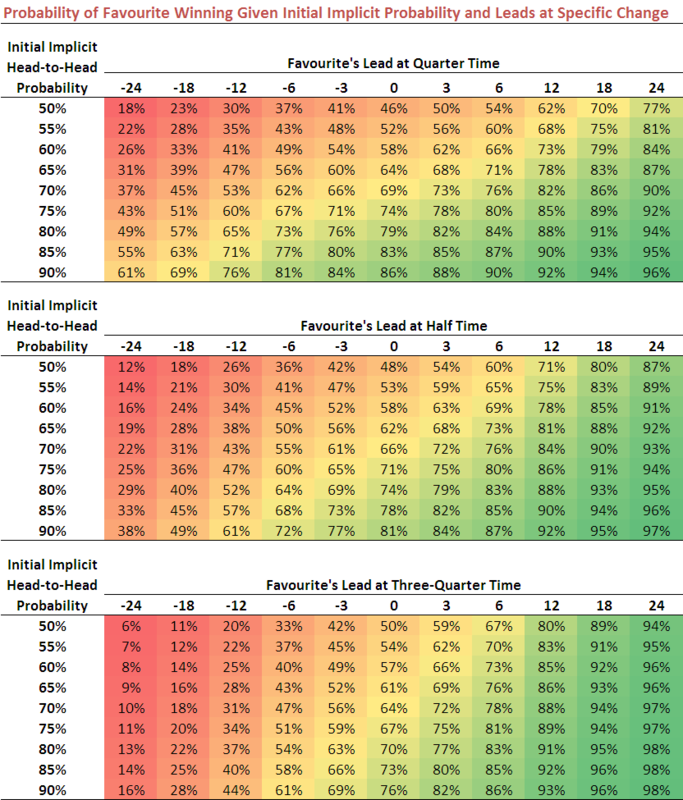 These estimates appear as the last three columns above and confirm that the favourite's pre-game probability independently contributes only 30% towards explaining a game's outcome even as early as the end of the first quarter. By half time its importance has shrunk to just 11%, and by three-quarter time to a mere 6%. In essence, virtually everything you need to know about the relative merits of the competing teams is encapsulated in the score by the time the final term rolls around. Now that we've fitted these models we can ask some other interesting questions. For example, by how much can the favourite trail at a particular point in a game and still be legitimately considered as the team more likely to win? In many cases, even for reasonably strong pre-game favourites, the answer is: not much. A team that was a 75% favourite - which means it was priced at about $1.25 pre-game - switches to being the underdog if it trails by 20 points at quarter time, 12 points at half time, or just 8 points at three-quarter time. The numbers for the 3QT model are particularly intriguing to me. Even a team that was a 90% favourite to win based on the pre-game odds - think $1.04 - will be the underdog in the contest if it trails by 11 points or more at the last change. So, for example, consider the first table, which provides the relevant probabilities for the score at the quarter time break. If a team that was a 75% pre-game favourite is level with its opponent at quarter time, it's still an 86% chance of winning. If, instead, it trails by 4 goals, its chances are just one half of that, or 43%. One interesting aspect of these tables is that they show that any pre-game favourite, regardless of the magnitude of its favouritism, has diminished chances of victory if it fails to lead at any change.